Occasionally I watch a few videos on the Youtube* and this one guy kept popping up as someone I should watch, RixCanDoIt. His videos are pretty good, and in the pencil videos he makes reference to his “MB grading” system. He’s thoughtfully provided a video on this MB grading System. Upon watching I had a few thoughts. First I think it is a great idea to create a personal system to help you compare pencils to a personal standard. ( More on this point in a bit.) Secondly, I don’t think that using shading is an accurate way to compare light/darkness while writing, for drawing yes, writing not so much. (more on this point later) Finally, using the lightbox behind the shaded area is not useful because it merely shows you how much graphite is on the page instead of how dark it is. 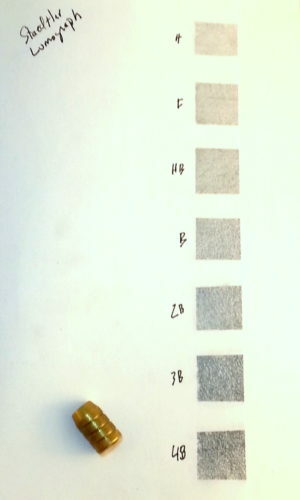 Creating standard references is a fantastic idea and tool to take the blind subjectivity out of “How light or dark is this pencil?” However, if someone were to come over, sit at my desk and create a sample to reference against my set of standards they would get entirely different results. There are a range of reasons for this. First when creating a sample with shading, this is a skill I’ve practiced, so I’m able to get very light layers of graphite built up, not everyone is able to get that effect with their pencils. 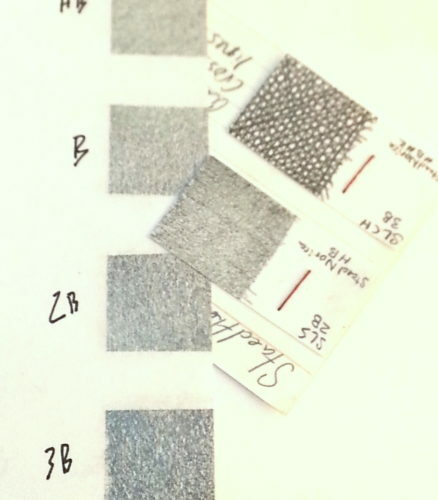 So My HB reference sample is going to be lighter than someone else’s and darker than others. So even though I’ve created a standard sample to compare new samples against, it will be different than another person’s. It would be disingenuous for me to suggest that my sample is a perfect sample. That can’t be done. My second point is that when you shade you use very light pressure and add as little graphite to the page as possible to build up shades of light and dark. So you are trying for a light even layer. This is not how people write or even sketch (draw yes, but that is another conversation. **) When writing we tend to use a variety of pressures and hold the pencil is a very different way then when drawing and shading. I wanted to create a standard that would mimic these varieties of pressure. As I was thinking about this- could scribbles do it? Yes, but there isn’t an effective way to control scribbles, but one can control cross hatching. I created two standards of reference- one shaded and one crosshatched using Staedtler Mars Lumograph pencils. Partially because in my mind this is what I compare everything to and also because I had a set on hand. 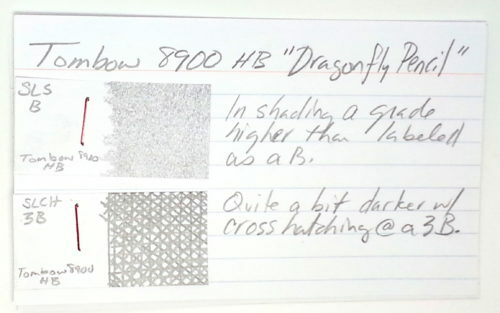 I created the standards on 8×10 HandBook FlexiBook paper. The paper is a dull white, non reflective, toothy and good with pencils. I also hate it so using it for samples suits my purposes. 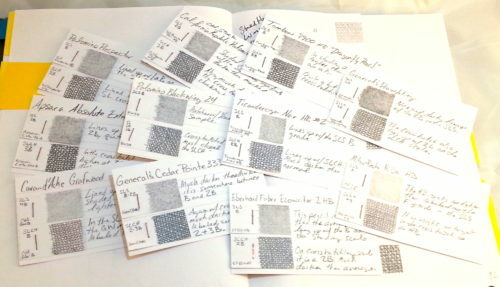 For individual samples I cut 3×3 inch squares of the FlexiBook paper and create a roughly 1 inch square in the middle. 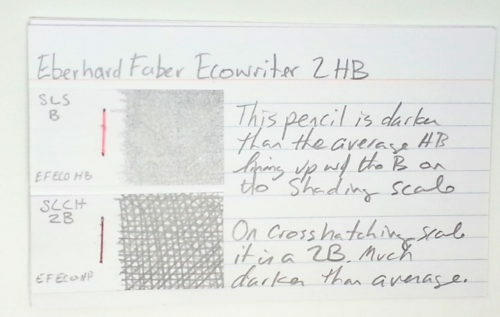 I trim this down to a small strip of paper and the graphite runs up to the edges making it easy to compare the sample to the standard. 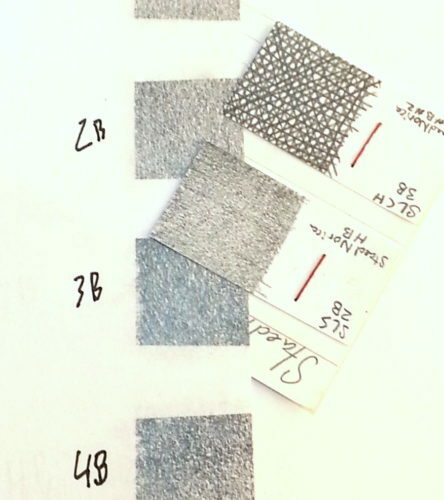 To visually compare the sample I lay the new sample against the standard. I look at it and if need be squint and let my eyes unfocus. 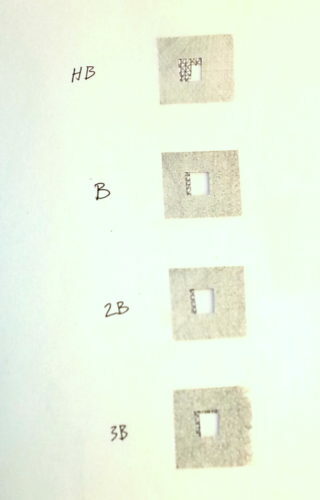 This way I’m not looking at the sample or the standard and I’m better able to see if things are similar. So my results are mixed. Some of the pencils are the same when shaded or when crosshatched, but I found quite a few that were a grade darker in crosshatched instead of shaded. This entry was posted in Uncategorized and tagged crosshatch, grading, shading, standard of reference on 20160526 by leslie.